12 Passenger Van Rental Services – Enjoy The Beauties Of Canada To The Fullest! Looking forward to an exciting family vacation in Canada? If yes, getting in touch with a company that offers high-class 12 passenger van rental in Toronto or Mississauga (cities from where you can start off your Canadian visit) is something you need to do first. Competitively priced van rental in Brampton are available as well – ensuring that you can also check out the charms of this city too! Apart from being spacious and having a solid body structure, passenger vans offer superior mileage and fuel-efficiency as well. 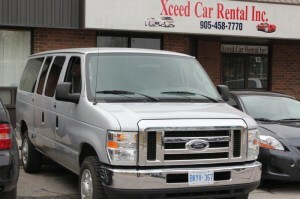 Companies that offer van rental in Toronto provide vehicles of different sizes. If you would be traveling with your family or office team-members, availing of 12 passenger van rental in Toronto would be advisable. The rental rates charged by the companies that offer van rental in Brampton, Toronto and Mississauga are extremely competitive as well. You will be able to plan your entire trip within your budget, without having to compromise on any of the fun elements associated with the visit. Availing of 12 passenger van rental in Mississauga, Toronto, and/or Brampton would also lend a fresh, picnic-like feel to your journeys. Won’t you love that? Wondering about how much you will have to pay, for hiring a 12 passenger van? A daily rental rate of $99.99 is applicable on these vehicles. The vans also have extra luggage space, and come with music and AC services as well. All-round travel comfort and enjoyment – that’s what you get when you avail of van rental in Toronto, Mississauga and Brampton – the three cities where passenger vans are most in demand. Nissan and Chevrolet are two passenger van brands that enjoy widespread popularity. This entry was posted in Passenger Van Rentals and tagged 12 passenger car rental, brampton, toronto. Bookmark the permalink.